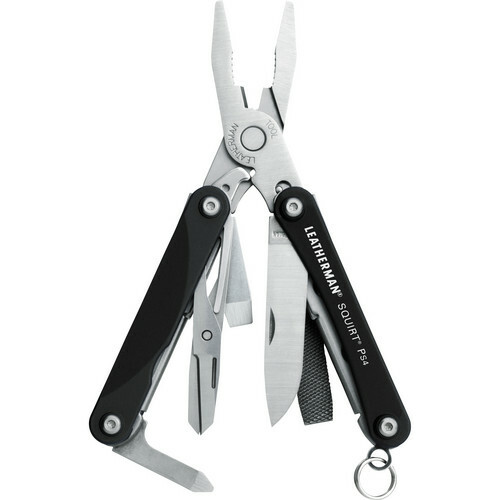 The Leatherman Squirt PS4 Multi-Tool features stainless steel construction with a black finish and 9 tools including the following: a 1.6" 420HC straight blade, and spring-action regular/needle-nose pliers and wire cutters. There are also medium and combo flat/phillips screwdrivers as well as a wood/metal file, bottle opener and riveted aluminum scales. All tools are outside-accessible except the pliers and wire cutters. The Squirt PS4 is easy to stow or clip with its key ring attachment. The Squirt PS4 is assembled in the USA. Box Dimensions (LxWxH) 6.7 x 3.0 x 0.6"